Truth: “Hair grows a half-inch per month, whether you cut it or not,” says John Barrett, owner of the John Barrett Salon in New York City. Hair may grow slightly faster in the summer, but that has nothing to do with the stylist’s scissors and everything to do with hormones, which do speed growth a little. One thing a trim will do: Eliminate split ends, making hair look better. Myth: Stress can make your hair fall out. Most of us have dealt with dry hair, a dry scalp, or both at some point. First there’s the static electricity standing-on-end look, then there’s the itching — just there, above the ear, no, no wait, over here by the neck, up, up, just a little more — then, if you’re really lucky, there’s the dandruff (but that’s another story). Dry hair, a dry scalp, and even dandruff have a myriad of causes and solutions. You need to figure out what’s happening to the natural oils your body should produce to keep your skin and hair healthy, and then you need to figure out how to replenish and replace that moisture. And that’s why we’re here. Salon products such as Kerastase haircare line prove effective. The process of making Paddywax candles is artisan in every sense, closely resembling techniques used to make candles hundreds of years ago. From fragrance throw to burn time, each custom recipe is made to deliver the best experience. Their fragrance blends are developed to distribute the most natural aroma through the use of all natural ingredients. They take pride in never offering a synthetic fragrance; instead they constantly push themselves to create something natural and unique. It begins when every candle is hand poured and ends when each product is packaged with precision. Each bow and label are applied by hand to give every product that human touch that is worthy of gift giving. They take pride in their work and know that every detail counts. At Paddywax they believe what is truly beautiful in life lies in the details and that is why they love what they do so much. They, and we, hope you too fall in love with Paddywax. Mason Pearson Brushes are the hairbrush of the stars. Known for their popularity in Hollywood, the complete line of Mason Pearson Brushes adds a wealth of beauty products to one’s boudoir. The fine high-end brushes. Owning a fine hairbrush is imperative to having a beautiful head of hair. 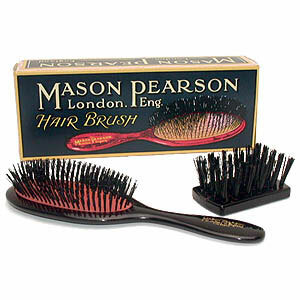 Mason Pearson Brushes are known to be one of the best hairbrushes made. Known for their rubber-cushion pad and classic handle, Mason Pearson Brushes are all handmade and crafted with the best materials. There are several key features that make Mason Pearson Brushes stand out from the rest in terms of quality and hair care. The hand made rubber-cushion pad that comes with all Mason Pearson brushes is unique in that it plays a major part of hair care as it is designed to massage the scalp. Mason Pearson Brushes are also known for the unique hand polished cellulose plastic handle, which is designed for comfort. The original collection of brushes had wooden handles, which are still available today. Advertised: Moroccanoil Intense Curl Cream is a leave in conditioner with anti-oxidants and intensive hydration capabilities. Intense Curl Cream enhances shine and defines curls leaving them soft and hydrated without a sticky residue. This product was recommended by a salon for my tight, often frizzy curls. The product does help to fight some of my frizz and moisturizes but it does provide any curl definition or dramatically improve the feel of my hair. It also makes the curls tighter and is available at a discount price.